Saifia College was affiliated to Vikram University. 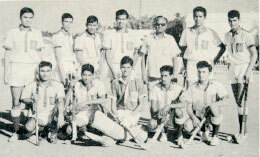 For the university trials in 1969, Ghufran gave his choice of Saifia College players to the coach Qamar. The list contained only one name - Aslam Sher Khan. Qamar was aghast and told Ghufran. "You are making a mistake." Ghufran was adamant. "If Aslam does not play, no player from Saifia College will represent Vikram University." I was played. y cousin, Taufiq Sher Khan, was offered admission as a hockey player by the talent scouts of Aligarh Muslim University. Getting admission as a player was considered an achievement. You did not have to pay fees, and were provided a full playing kit. Taufiq kept after me to accompany him to Aligarh. I was not happy about going to Aligarh as the opening was being provided by uncle's son. Father was always against it, mother even more so. She denounced making such headway in life, and termed it as shooting a gun from another man's shoulder. One Friday, after prayers, I saw a labourer cutting wood in a vacant plot of land adjacent to the mosque. Father used to cut wood occasionally to keep trim after his hockey playing days were over. Since the woodcutter's shack was near my house, I decided to keep trim by cutting wood. The woodcutter had known my family for a long time, and had no hesitation in lending me his axe. Dressed in shorts and a sweat shirt, I kept axing away. I was so engrossed in the exercise that I did not hear a motorcycle stop on the road. I heard a half-taunting, half-serious voice "Olympian Ahmed Sher Khan's son is aspiring to be a woodcutter instead of a hockey player." Perched on a log of wood behind me was Ghufran-e-Azam, a student leader who was also a sports promoter for the local Saifia College. Ghufran, who had his early schooling in Jamia Millia in Delhi, was one of the first boys to join Saifia College. It was his effort and advocacy that prompted Saifia College to adopt the pattern of Aligarh Muslim University in sports promotion. I stood sheepishly before him - eyes lowered. "I do not want to play hockey anymore," I said. I pointed out to him that hockey in Bhopal was in the hands of clubs, and every club was as bad as the other, so where would I go? "To college," was the prompt reply, "Saifia College. People like us have to fight the system and bring hockey back from clubs to the educational institutions. I do not promise anything to you, except that you will be a brother to me, like the rest of the boys. If your game is worth it, I will see that you play." That night, after dinner, I told Taufiq that I was not interested in Aligarh Muslim University. I joined Saifia College the next day. On the hockey ground, things were not as smooth as I anticipated. The senior players took an instant dislike to me, but the awe and respect in which they held Ghufran softened the hostility. My debut in an All-India tournament came when my college participated in the Obaidullah Khan Gold Cup in Bhopal. Everybody wanted me excluded from the team. Even the secretary of the Saifia Educational Trust tried his best to convince Ghufran that I should not be played. Ghufran was equally insistent that I be played. I was played, and my debut in the Obaidullah Khan tournament was considered good. Saifia College was affiliated to Vikram University, and for the university trials in 1969, Ghufran gave his choice of Saifia College players to the university coach Qamar. The list contained only one name - Aslam Sher Khan. Qamar was aghast. "You are making a mistake," he told Ghufran. That kal ka chokra has no big match temperament. There are more seasoned and experienced players." Ghufran was adamant. "If Aslam does not play, I will see to it that no player from Saifia College represents Vikram University." I was played. Ghufran called me aside. "Forget your father's honour, forget my respect, only remember that you are a player who has to represent his country in the Olympics. Prove that the younger generation has the calibre." I went on to play in the MCC Gold Cup in Madras and the Jawaharlal Nehru tournament in Delhi.